In addition to writing the ten book Martin Beck series of police procedurals with his partner Maj Sjowall, Per Wahloo wrote several novels one his own. Judging solely from the one I’ve read so far, The Steel Spring, they are not his best work. Written in 1968, The Steel Spring covers much of the same ground the Martin Beck books will explore. In The Steel Spring, Detective Jensen, a dogged detective, basically a loner who expresses few if any opinions of his own, finds himself outside of the country when catastrophe strikes his homeland. Though the borders are closed, he is able to get into his un-named homeland, where he has been given the task of investigating what happened while he was abroad, namely the complete breakdown of society due to a disastrous plague. Though Jensen is a detective stuck in a science fiction setting, he is really an early version of Martin Beck; think of him as Martin Beck with the rough edges still intact. The investigation serves as a plot device to examine the faults Mr. Wahloo finds with his own government. As is always the case in the best dystopian science fiction, the faults he find still speak to our times. Many readers will say that The Steel Spring is not a good book because it wears its political heart on its sleave. Modern readers do not like to find politics in their fiction. We can talk about politics all the time, many of use in America do, but when characters in a novel talk about politics, we don’t like it. It’s not realistic, we’ll say. It’s preachy. The Steel Spring has taken its share of lumps for just this reason. The plot and the characters really are there to serve the author’s political agenda. Something that is not true in the Martin Beck books though the author still manages to work in his political agenda quite a bit. 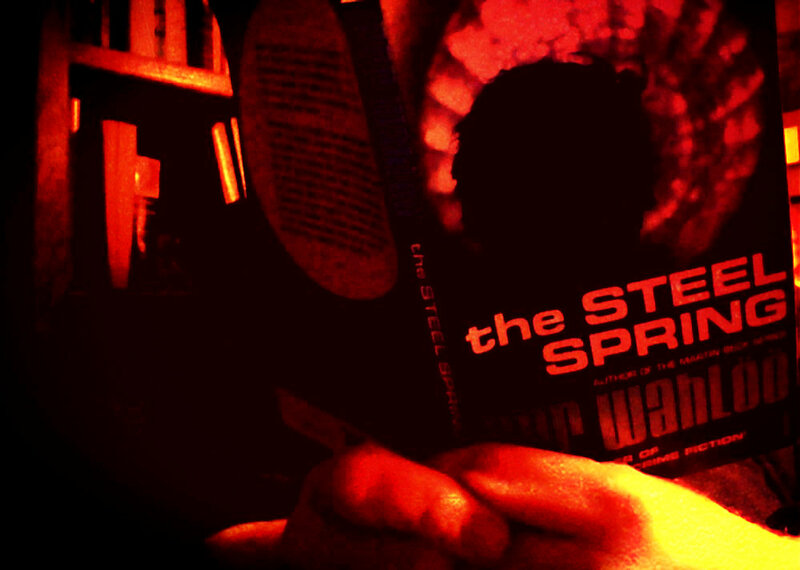 However, if you can set the issue of politics aside, The Steel Spring still isn’t a very good book. It’s good, but it’s not nearly as good as the Martin Beck books that followed it. I’m glad that Vintage has published Per Wahloo’s books; it was fun to get the chance to read them (I’ve another on my TBR shelf) but they are not going to knock Martin Beck off his throne. The characters in The Steel Spring, the imagined world, the storyline, are just not as compelling as any of the Martin Beck series were. And Per Wahloo did a much better job making his political critique in the Beck series, when it had to play second fiddle to just about everything else. I always wonder why they’re so touchy. People will read a book about someone with a different religion than theirs, for example, which ought to be much more profound difference than politics. It really bugs me in dystopian fiction, which should have a political critique at some point. If you won’t discuss politics, how can you critique a society?